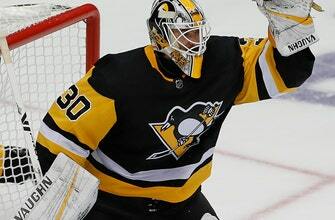 PITTSBURGH (AP) — Pittsburgh Penguins goaltender Matt Murray is out indefinitely with a concussion. Coach Mike Sullivan said Murray suffered the concussion during practice Monday and reported potential symptoms to the training staff immediately afterward. Sullivan did not offer specifics on the nature of the contact that led to the injury. This is the third time in his NHL career the 24-year-old Murray has been diagnosed with a concussion. He suffered one in practice last February and missed nearly a month. He also suffered a concussion late in the 2015-16 season when he collided with Philadelphia’s Brayden Schenn. Sullivan said the team is focusing on Murray’s health and not the number of concussions he has suffered. Murray, who won a pair of Stanley Cups with the Penguins in 2016 and 2017, struggled during the opening week of the season. He allowed six goals in an overtime victory over Washington and then let in five in a loss to Montreal. Sullivan was quick to spread around the blame for Pittsburgh’s sluggish start, pointing to a group that played sloppy away from the puck. “We’ve got to be a more difficult team to play against,” Sullivan said. Casey DeSmith will get the first chance at replacing Murray. The Penguins also recalled Tristan Jarry from Wilkes-Barre/Scranton of the American Hockey League. DeSmith went 6-4-1 with a 2.40 goals against average and .921 save percentage as a rookie last season. The Penguins are off until Thursday when they host the Vegas Golden Knights.